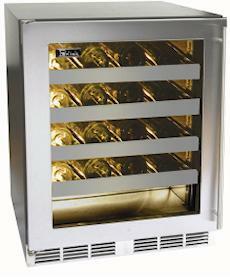 PER HP15WS-3L Stainless Steel wine cabinet by Perlick, Signature Series. 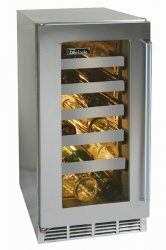 15" Stainless Steel Wine Reserve with stainless steel glass door. Perlick offers a variety of wine cabinets in the Signature Series, Commercial Series, Indoor, Outdoor, and Shallow Depth models. 15", 24" & 48" wide cabinets in single and dual temperature zones. See more information on the Full Perlick line below. Unmatched in terms of temperature control - a result of Perlick's unique forced air cooling system and Stainless Steel walled interior construction. The Variable Speed compressor offered in the Signature Series also reduces vibration and conserves energy... But the C Series is also extremely quiet, virtually vibration free and energy efficient! 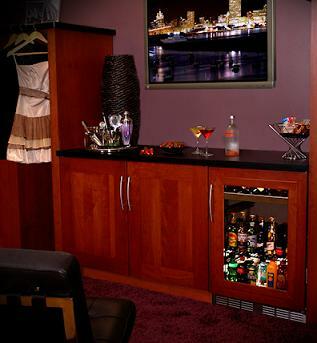 All of the Perlick wine storage cabinets have quality full-extension shelfs and UV protected glass doors. Numerous configurations are available for you to choose from. There are three hundred customized cabinet combinations available! What sets Perlick's Signature Series apart from the competition? Forced air working with compressor allows temperature to remain constant throughout the cabinet. (Cold Plate systems can't offer same degree of temperature consistency) Stainless Steel interior also helps to regulate temperature. Front vented, forced air refrigeration system - All units can be built in. Dual and Triple temperature zones have a thermostat for each zone and walls separating the zones. Electrical requirements: 115V, 60Hz., 1 phase AC, 3 amps. NOTE ABOUT LOCKS - A locking system is available as an option, please specify at time of ordering. You still have the Perlick Quality compressor working with the forced air system to allow for consistent temperature throughout the cabinet. Stainless Steel interior also helps to regulate temperature. 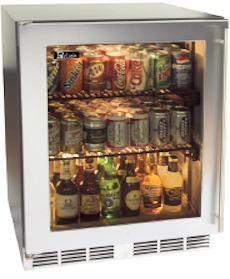 'C' Series cabinets are ideal in a residential environment at a less expensive cost than signature series! The 'C' Series have single speed compressor as opposed to variable. How is the C series different than the Signature Series? Single speed compressor as opposed to variable. NOTE: The Variable Speed compressor offered in the Signature Series also reduces vibration and conserves energy... But the C Series is also extremely quiet, virtually vibration free and energy efficient! Stainless steel ball bearings in shelve slides. Stainless Steel trim with Glass Door or Solid/Full Stainless Steel. Wood Panel accepting door - Glass with wood overlay trim or accept full/Solid panel. Benefits of the Perlick – Forced Air System. The Perlick Forced air system in the Signature Series will run in low speed rpm (because of the variable speed compressor) which is seeking to minimize energy consumption while maintaining correct temperature. Causing the system to run very little anyway. The standard compressor in the C series will run more often, for shorter intervals but the temperatures are managed the same. Keep in mind, the bottles lay on their side too, providing moisture to the inside bottom of the cork. For the minimal amount of humidity being removed, it would never affect bottles stored on their sides and the corks from drying out. Perlick believe that cold plate systems also have a wider temperature differential from top to bottom of the cabinet – again supporting their Forced Air system as superior. Commercial grade stainless steel interior, use what the pros use! Your quest for the ultimate in luxury living ends here. For almost 100 years, the Perlick has been known for their engineering and industry leading quality. After nine decades of supplying under the counter beverage dispensing and refrigeration equipment to the finest restaurants, resorts and hotels in the world, Perlick has turned their talents toward creating the ultimate in-home entertaining - the Ultra Lounge for the home. Designed exclusively for the most discriminating wine collector, Perlick products are currently unlike any other small cabinet available in the market today. Innovative design, professional craftsmanship, and exclusive features, made Perlick a leader. It's the pinnacle of luxury home entertaining - made elegant and easy by Perlick. All products are designed and crafted to look and perform better, than any other alternative. Perlick is the only company to present you with multi-zone under counter refrigeration available in 24-Inch and 48-Inch configurations, while allowing you to choose the size and configuration of your under counter refrigerated cabinet to best accommodate your entertaining needs. 24" Signature Series is also available in Shallow Depth of 18" deep. All Perlick wine cabinets are available for shipping within the United States of America (USA) and Canada. Perlick under counter and exterior grade stainless steel wine cabinets are brought into Canada via Toronto, Ontario, Canada M9W 4X3. They are produced and distributed in the United States of America, out of Wisconsin, Milwaukee, WI 53223, USA. Perlick has specific trading areas within the US. We may not be able to sell a Perlick into your area.